Enjoying the benefits of salt therapy takes no effort at all. Simply breathing allows microscopic salt particles in the air to enter the sinuses, travel deep into the respiratory tract, and eventually settle at the cellular level. This process restores optimal levels of moisture and sodium in the airway linings, which cleanses them, clearing mucus and reducing inflammation. It also kills bacteria, enabling a better immune response to allergens, irritants, and pathogens. Therefore, in addition to alleviating current symptoms, salt therapy helps reduce or prevent recurrences and/or sickness, and may help reduce dependence on medications. 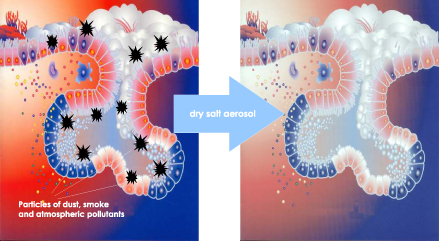 The effect of airborne salt has also been shown to benefit those suffering from a variety of skin conditions, particularly psoriasis and eczema. Salt Room guests must be age 18 or older. We're a FRAGRANCE FREE FACILITY. Please refrain from the use of perfume, essential oils, cologne, etc. when visiting.